Home > Insights > Is Your Data Strategy Ready To Keep Up? I remember a few years ago when, as enterprise architects, we sat around in the office of the VP of architecture and planned our data strategy on the whiteboard. Replace that clunky warehouse with a modern appliance? Check. Enterprise data model? Of course! The dreaded data governance plan? Yup, but our discussion was about IBM’s latest tooling, not the fact that there was already a data code management group that didn’t talk to IT or care what we did. That was before Hadoop, data lakes, and the open source revolution, but it was just at the dawning of the age of the customer. Had we known then what was coming at us . . . ah well. My point is that many of our clients sit in similar, if a bit more modern, situations today. I talk to these clients every day, and I want to help them prepare not for the challenges they face today but for what is coming down the pipe. The single biggest overriding factor that should concern CIOs, their staff, and their business is the relentless accelerating pace of business, driven by information technology. The age of the customer began because information technology empowered customers and firms began to offer them more information and more choices. Today, the overriding force is the power that emerging technology is bringing to innovation and business-model change efforts. With each generation of emerging technology accelerating the returns of the next, what we see is sustained, technology-driven business acceleration. Advanced firms are investing more in emerging technology, and this new technology accelerates their returns on previous technology investments — that is, they get more benefit from their investments than firms that have been sitting on the fence. Furthermore, the more firms invest, the faster they go. It’s a vicious cycle with a big (I mean, large) data component. My take is that the investments your business makes now are more critical than you realize. I’d like to invite you to join me as I keynote on this topic at our Data Strategy & Insights 2018 Forum, December 4–5 in Orlando. 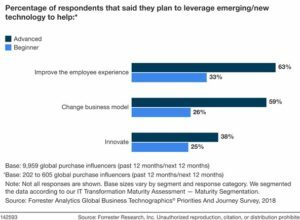 Unlike many other data and analytics events that are extended vendor advertisements, Forrester will combine our extensive data and insights analyst expertise with great content from buyers and a few vendors that we have personally selected for their innovation. It will be refreshing and unique, and I invite you to come join us. Lastly, I would like to extend to you an offer of complementary tickets if you are an enterprise technology buyer (not applicable to vendors and consultants). If you would like complementary tickets, let me know here or connect with me on LinkedIn.